While all of my kids (ranging in age from 8 months to 5 years) have loved playing with their ALEX Jr. Maxville Blocks, I know that my littlest will get the most use out of them as he grows. He’s already right there exploring them with his brother and sister. …explore sounds. Babies can bang the blocks together and onto different surfaces to explore the sounds they make. …explore textures. Graphic patterns on the Maxville Blocks offer visual textures for infant eyes to explore. …develop spatial awareness. Touching and even tasting the blocks helps babies learn about the space around them. …learn about cause and effect. When babies drop building blocks onto the floor, they make sounds. And when they bump a stack of building blocks, the blocks tumble down. All of this teaches baby the basics of cause and effect. …strengthen fine motor skills. Turning blocks in their hands and passing them back and forth help babies practice important fine motor skills. So even though my little guy isn’t yet building elaborate towers or participating in imaginative play with his older siblings, he’s still learning. There will be plenty of time down the road for elaborate cities made of building blocks. How do your kids play and learn with blocks? 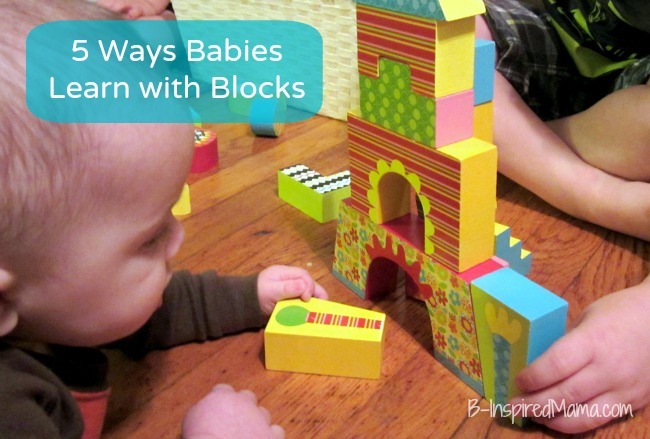 Did your kids like building blocks when they were babies? Today’s guest blogger is Krissy, a former art teacher turned full time mama of 3. Blogging at B.Inspired Mama allows her to connect with other moms and share simple ideas for kid-friendly arts and crafts, easy recipes, preschool learning fun, and creative parenting tips. Follow along with B-Inspired Mama on Facebook, Twitter, or Pinterest. As he pushes a rectangular block underneath the arch, he starts seeing what fits under the a curve. This is the basis of calculus. As he notices how the angles fit together, he’s seeing supplementary angles at work. He’s developing his knowledge of geometry. The puzzle piece like blocks at the top inspires thinking that will later let him see sets and their complements. He’s getting a gut feeling for set theory. Thank you for your comment, these are great points! Learning math skills early will be a benefit later in life.